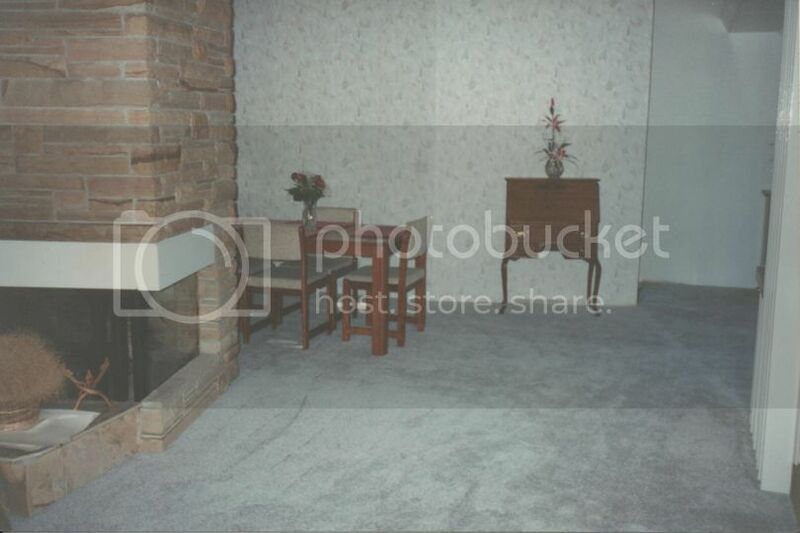 The dining room is really a dining area, as there are not four actual walls, and certainly no door. I grew up in a very traditional home with a small formal dining room that I can honestly remember eating in ONE time in my 19 years at home. Having an actual room dedicated to eating was not high on our priority list, so when this house had just an area for a table, it fit the bill perfectly. Here is the after image - ta-da! All new carpet! I'm quite certain carpet in the dining room is never a good idea. 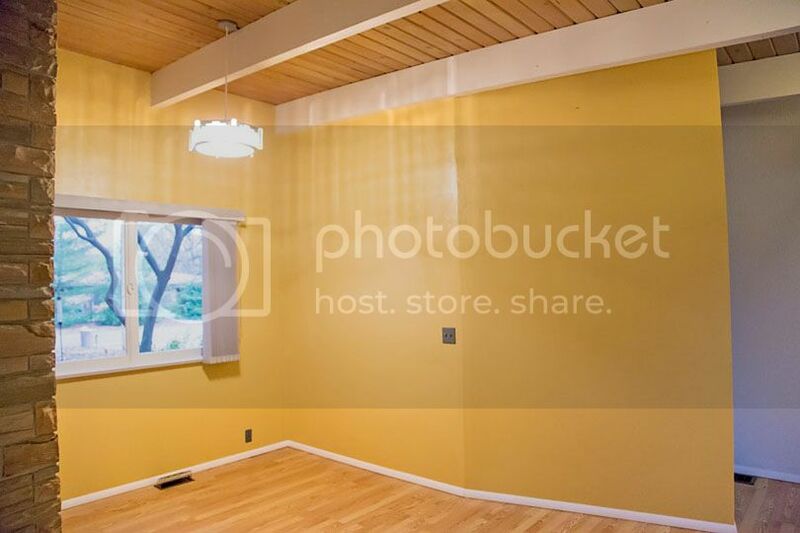 And at some point, the people we bought the house from replaced the light fixture, painted the walls & trim, and upgraded from carpet to laminate flooring. It was the nicest looking spot in the house the day we closed! Although taking down that wall and opening it up to the front door was high on my to-do list. Today, it is a far cry from what it looked like in 1995. We took the laminate flooring out, and actually have it in the basement with plans to lay it down (it clicks & locks into place) in our storage room once we get to that big organizational project! We had to move the light switch over a bit, since it was housed in the wall we took down. 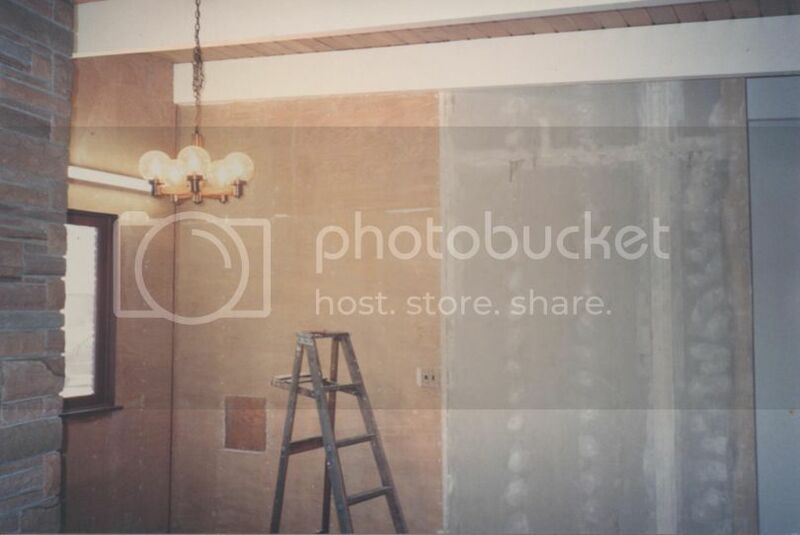 And the milk door is behind the drywall - we actually used it on the outside by hiding outdoor electric in it. I plugged Christmas lights in to it this year. Hardwood floors throughout the first floor of the house really make the entire house flow. That little orange bookcase in this photo now lives in our bedroom, and in its' place is a bar cart - it's perfect in here. I LOVE our Rejuvenation light - it's perfect and seems to float about the table perfectly. Backing up a tad, this dates prior to the first photo, since the beams are not painted white yet. 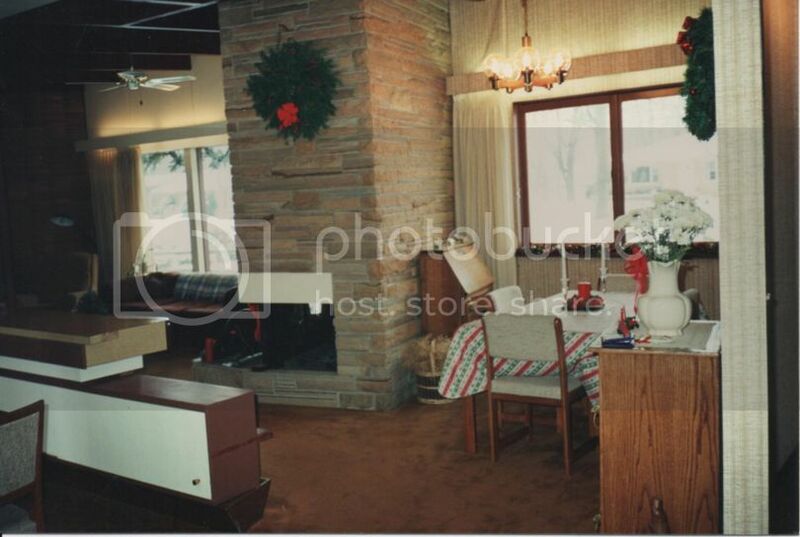 This is another view into the dining room. This is looking from the former office area (now kitchen area). 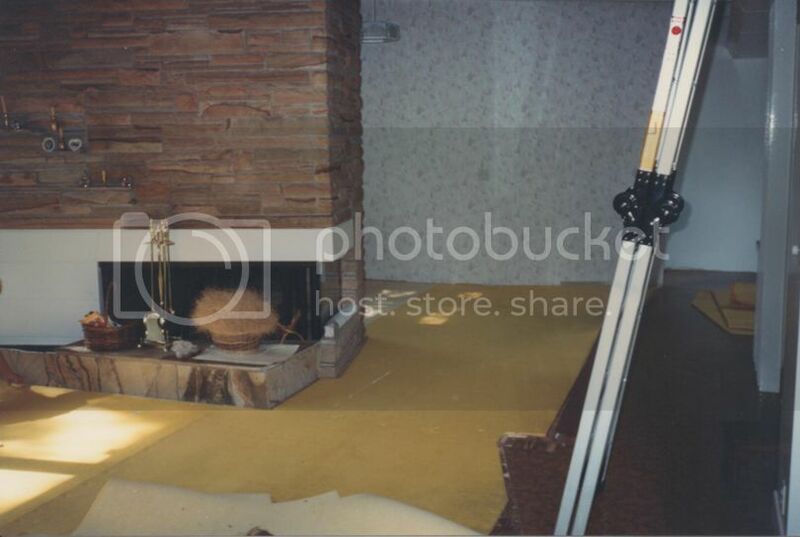 You can see the two different floors here - the carpet was long gone, but that laminate floor was still here, under many layers of various floors from over the years. 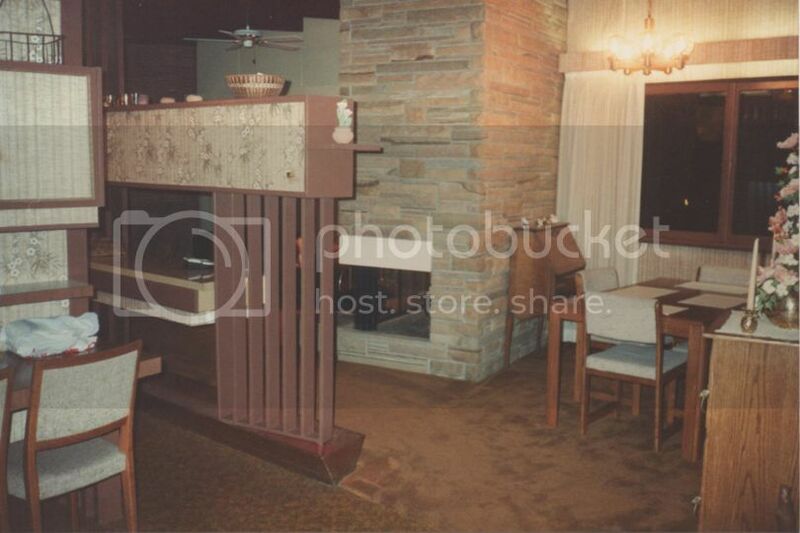 This room divider intrigues me. I cannot really imagine what exactly it was used for. 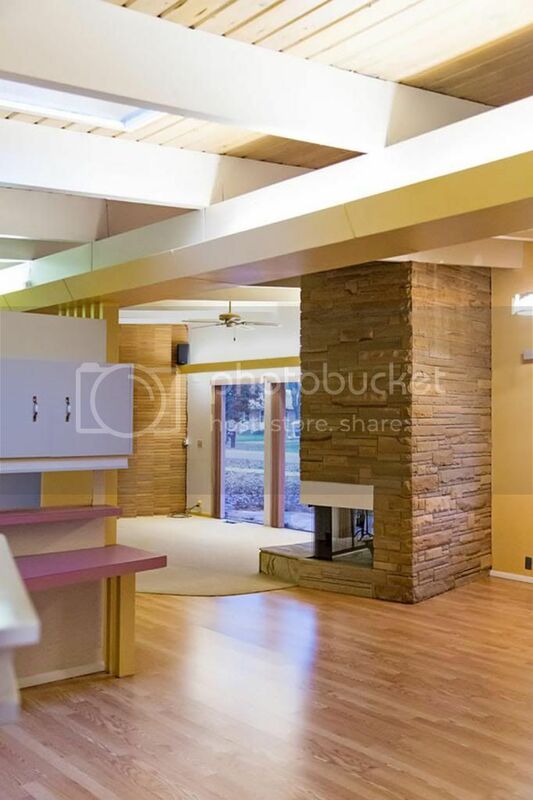 Sort of like a floating counter area between the kitchen and the fireplace, I suppose it creates a walkway into the living room. And a storage area up top with sliding doors. That slat detail was in a few spots - just 2'x4'. And here the wall divider gets shorter and reconfigured. The base is the same, but the storage cupboards gets put on the bottom, with the counter above it - still the same idea, but opening up the space to the living room more. Ceiling beams are still naked wood at this point; gotta love all the pinch pleat drapes!!! This is the day after we closed. Room divider is gone, carpet is long gone, laminate floors actually look pretty great, and the former owners told us the carpet was fairly new. The mauve countertops in the office area match the vertical blinds in the living room - score! Another shot of what it looks like today. We picked up this dining room set at an estate sale (for the first house we offered on and did NOT get!) Because the walls were so tiny, wallpapering made sense in this area. 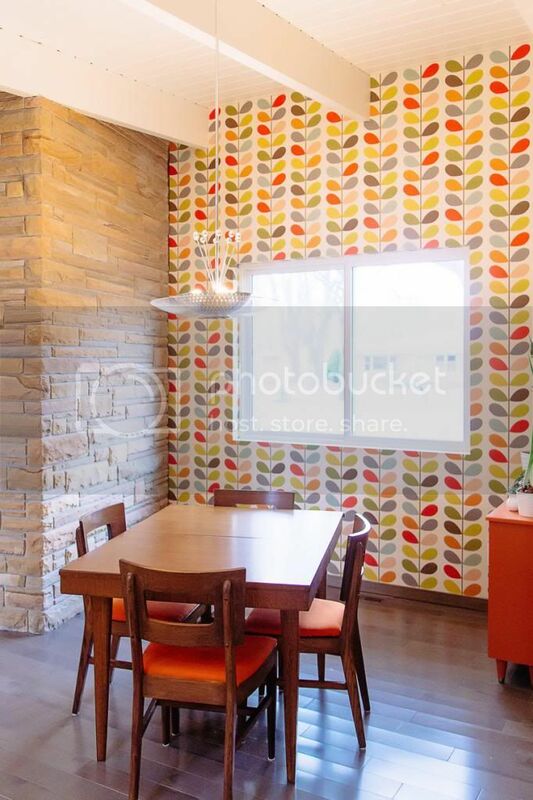 We LOVE the Orla Kiely paper we used - it's perfectly colorful for our otherwise plain walls. 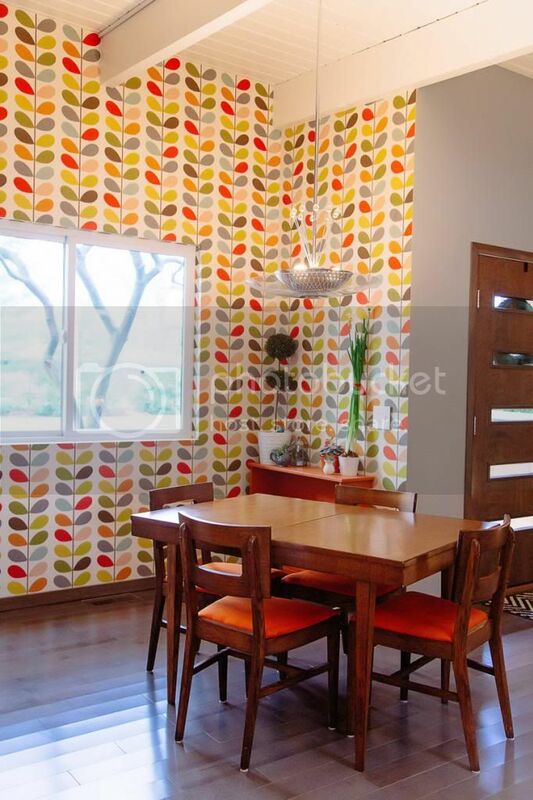 Love the Orla Kiely wallpaper. So whimsical! Love seeing the transition and changes over the years! You have it looking so adorable now. Great job!